Readers of Intermediate Physics for Medicine and Biology learn topics in medical physics from a physics point-of-view. Often, however, the discussion in IPMB doesn’t emphasize clinical applications. Where can you get more clinical information? Radiopaedia! Radiopaedia.org is a free online website with a large collection of radiology cases and reference articles. To see what this site is like, I typed some terms into its search box. When I searched for MRI, I found articles about topics that Russ Hobbie and I present in Chapter 18 of IPMB, such as MRI pulse sequences and MRI artifacts, but also a wealth of clinical topics such as protocols for MRI brain screens, stroke, demyelination, and rectal cancer. The site also contains many case studies of specific patients. And it doesn’t cost a thing. Radiopaedia has much information about nuclear medicine (Chapter 17 in IPMB). I typed “99mTc” into the search box and found articles describing a variety of radiopharmaceuticals based on the technetium-99m radioisotope. Also, the site has much information about positron emission tomography (PET) and single photon emission computed tomography (SPECT). Radiopaedia covers the interaction of x-rays with tissue (Chapter 15 in IPMB) in a variety of articles about different mechanisms such as the photoelectric effect, Compton scattering, and pair-production. Many features of x-ray technology are also discussed (Chapter 16 in IPMB), like x-ray tubes, filters, collimators, grids, and intensifying screens. But also describes x-ray images of specific body parts, such as the abdomen, pelvis, ankle, and shoulder. And all this information is available gratis. The web site discusses computed tomography qualitatively, but not quantitatively, and lacks much of the mathematics presented in Chapter 12 of IPMB. It contains many medical images, but almost no other figures. For example, the discussion of four generations of CT scanners would benefit from a figure, like Fig. 16.25 in IPMB. Ultrasound is covered in Chapter 13 of IPMB, and also in Radiopaedia. Topics include transducers, pulse-echo imaging, elastography, and Doppler imaging. Best of all, this valuable information is on the house. One of the best parts of Radiopaedia is the quiz mode for patient cases. You get to be the doctor, analyzing different medical problems. These cases are too difficult for me to diagnose, but perhaps you can. I find Radiopaedia to be a helpful, no-cost supplement to our book: IPMB supplies the math and physics, while Radiopaedia analyzes the clinical applications. 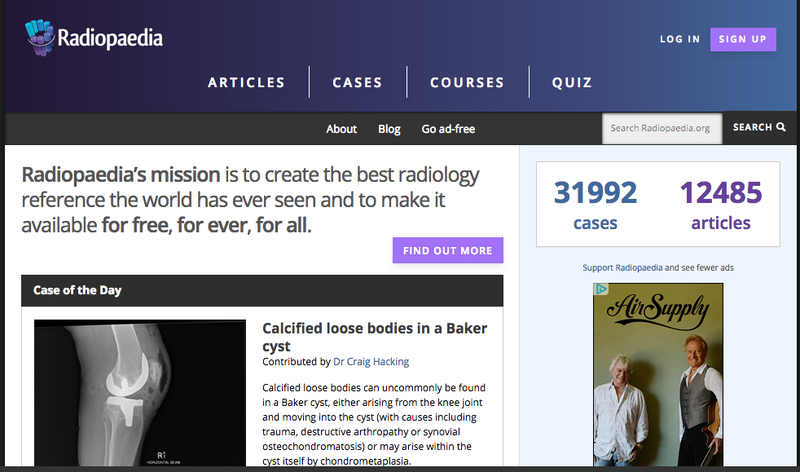 Did I mention that Radiopaedia is free?